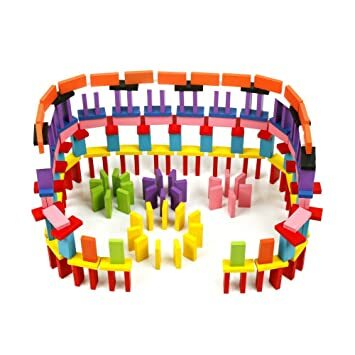 A very funny toy for your kids to develop baby eye and hand coordination ability. Made of environment-friendly linden wood, Smooth and no burrs, no harmful to your baby. Push one of them, it will have a chain of effect. 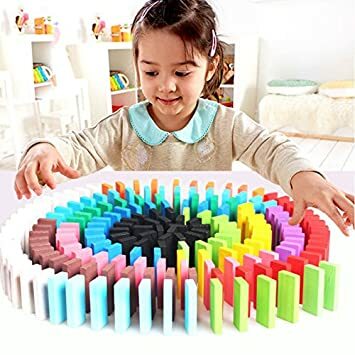 This wooden domino set can be used as a stacking and building toy. Different shapes can be created out of the chips, helping kids to enrich their imagination. Kids' operational ability can be trained when they are having fun. Also, this may keep the kids playing with them for hours and create marvelous shapes without giving parents hard time. No screws, glue, nails or any other tool needed. They are just made of high quality 100/% real wood. It will not do harm to your kids. Nice gift idea. A very funny toy for your kids to develop baby eye and hand coordination ability. .
Made of environment-friendly linden wood, no harm to your baby. Push one of them, it will have a chain of effect. Single Piece Size: 1.7 inch/(4.3cm/) x 0.83inch /(2.1cm/) x0.28inch/(0.7cm/). To be safe, please do NOT leave it with kids under 4 years alone.